The moss garden was conceived and installed beginning in 2013 after attending a class in Pennsylvania with my sister-in-law at Moss Acres. The day long event was loads of fun and we left with the know-how, courage and necessary supplies to get started planting our own moss gardens. Of course, I quickly became obsessed with this, and ultimately transplanted many varieties of moss from our property in the Adirondack Mountains in upstate New York with pretty good results. Over the years, I have also accepted moss samples from friends' properties throughout New England, Cape Cod and Martha's Vineyard. Not all transplants were successful. But enough were, and those hardy souls continue to survive and to thrive, now entering their 5th year. Moss is one of the oldest plants on earth. Growing moss is a truly Zen experience and not as difficult as you may think. The trick with planting a moss garden is having enough shade and properly prepared, acidic soil. Moss will not grow on a porous surface. So, avoid any surface where air may be present under the moss. 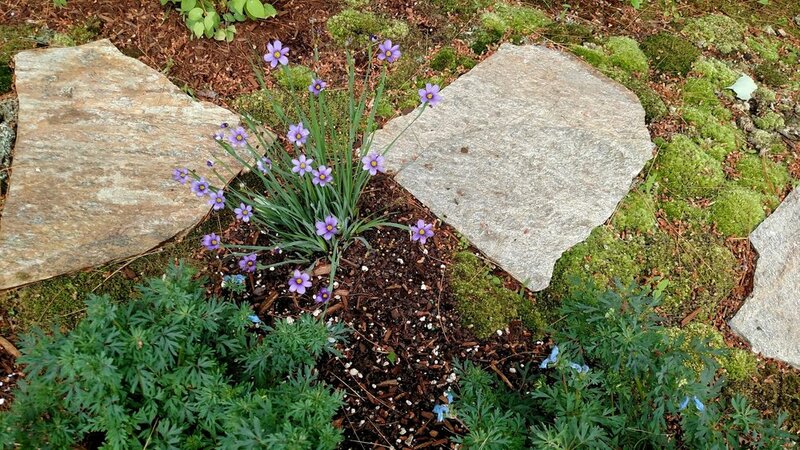 The harder packed the soil (or rock surface), the easier it will be for it to attach and begin to spread. I simply walk directly on any dislodged sections, pressing down for a few seconds, and that's usually enough to help the moss reattach to its original surface. Initially, I was concerned about the constant moisture that moss requires to reveal it's emerald green. But I soon learned that it could survive just fine with the daily sprinkle from our lawn irrigation system and occasional spritzes from the garden hose later in the day. We have a whole house filter that removes harmful chlorine from the city water, so my initial concerns about pH and other potential problems with tap water have been alleviated. The 5.5 pH of southern New Hampshire's soil is perfectly suited for most types of moss. Can't provide regular water? No problem. Moss that has attached to soil, rock or tree bark can also withstand extended periods of drought. It will appear "mostly dead", but as we know from Miracle Max in The Princess Bride, "mostly dead is not all dead". Just add water to your "slightly alive" moss, and watch it perk up in a matter of seconds. Sure, birds and squirrels will peck and dig at your moss. But I have discovered that simply hosing the moss filaments and pieces into other areas of the moss garden is all you need to propagate bare areas. It's kind of amazing, really. For the first couple of years, I tried to cover my moss with sheets of fine tulle to deter the birds and critters. But I found this to be more hassle than it was worth. I now just let nature take its own course and have fun watching the results. ask me about moss gardening!